Find out all kinds of Yorkshire Terrier facts and discover what makes this breed unique. The Yorkshire Terrier’s origins lie in the North of the United Kingdom. Also known as the Yorkie, this breed is descended from a multitude of different small terrier breeds. Officially named by the Kennel Club in 1886, the first breed standard was published in 1898. The Yorkshire Terrier was originally prized for their working ability as a rodent killer, but also as a hunting dog to unearth small prey such as rabbits. Later in time, the Yorkshire Terrier breed became fashionable as a pet and began to be bred for decreased size. In the early days of being shown, the Yorkshire Terrier was shown on a silk cushion and now remains the only breed which is still exhibited in such a way – although the cushion is now replaced by a decorative box in the show ring. The Yorkie has a small, delicate head, small V-shaped ears, and dark eyes. It has a compact, sturdy body and a long straight tail. Their small feet should have black nails. The signature feature of the Yorkshire Terrier is their long, straight, fine coat, which should be a dark steel blue from the eyes to the base of the tail. The hair on the head is also long but should be a golden tan in colour. 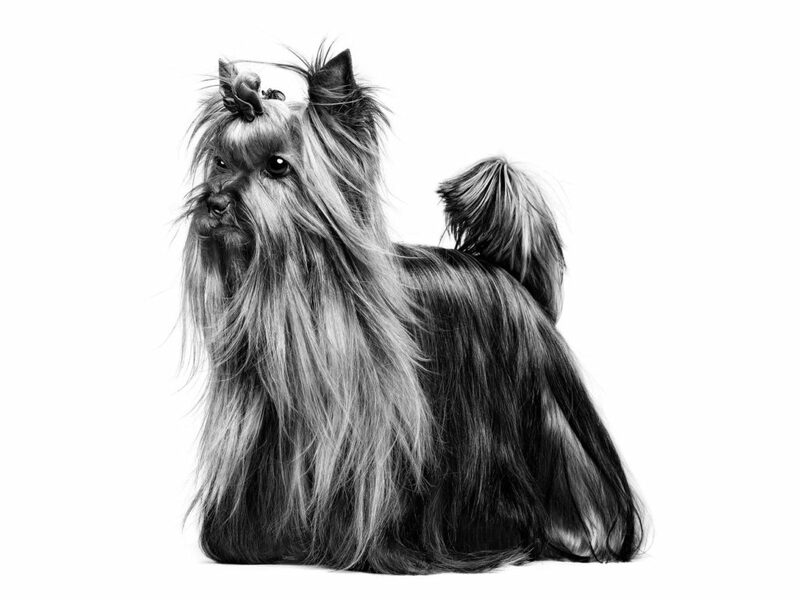 When it comes to Yorkshire Terrier grooming, one thing that should never be missed is brushing on a daily basis – due to their abundance of long hair. Brushing will help reduce shedding and will help maintain your dog’s skin and coat health. Their delicate and precious appearance can be deceiving as the Yorkshire Terrier personality tends to be courageous, lively and strong willed. The Yorkshire Terrier’s origins as tenacious ratters have not been forgotten! An intelligent and alert breed, the Yorkshire Terrier temperament is often bold and rarely timid, however they do enjoy the indulgence that comes with being a pampered lap dog and can be quite possessive of their owner’s attention. At the start of its life, the Yorkshire Terrier’s weight is only a few grams, but they do grow rapidly over a short period of time and growth is complete by 8-10 months of age. During this time, their body is growing and developing, their impressive, silky hair-like coat remains black until around 3 months of age when the dark steel blue appears. 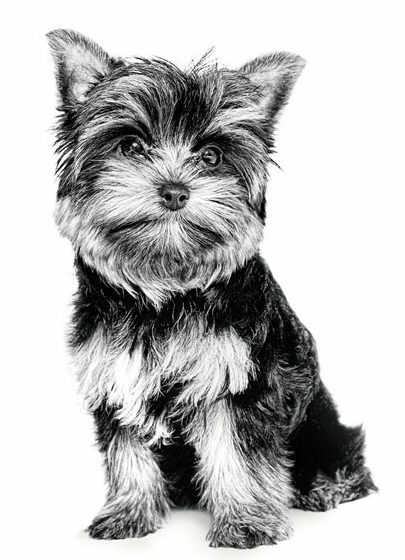 Ideal Yorkshire Terrier puppy food: ROYAL CANIN® Yorkshire Terrier Puppy. Their long and silky coat takes a lot of care to maintain, which makes the Yorkshire Terrier’s grooming needs quite significant. Daily combing and a diet which provides specific nutritional support – such as a supply of proteins and omega fatty acids – is beneficial for helping to keep its coat in peak condition. With their delicate jaws, the Yorkshire Terrier can be a fussy eater, but maintaining a consistent, quality diet will help. Dental concerns can affect small breed dogs in particular, but feeding a specifically tailored Yorkie food kibble can help to combat this, whereas feeding a wet diet can help stimulate the appetite of a picky eater. As with many toy breeds, the Yorkshire Terrier has a longer than average life expectancy and consideration should be given to adapting their diet and supporting a healthy aging from around the age of 8 years. Ideal adult Yorkshire Terrier food: ROYAL CANIN® Yorkshire Terrier Adult.